The program starts and ends in Kuala Namu Airport of Medan. Medan is 1 hour fly from Singapore and Kuala Lumpur. Enjoy your first day in the eco friendly family hotel Deli River with your room in the middle of tropical garden. 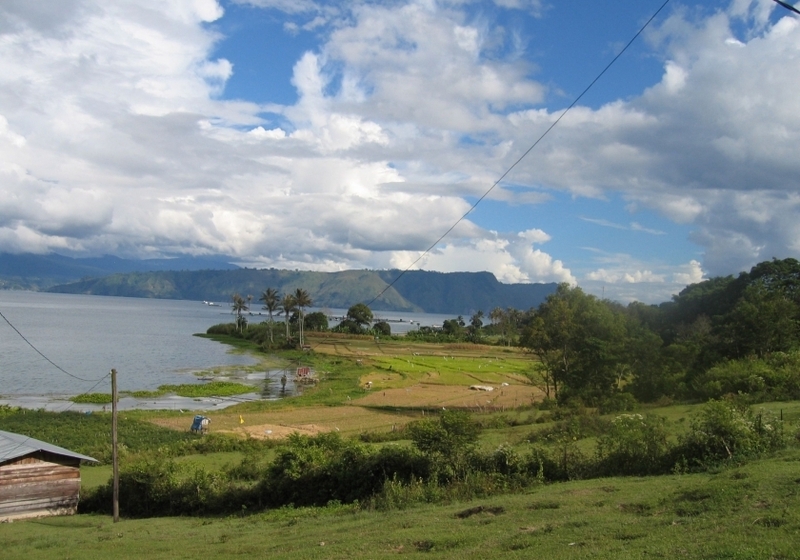 Hereafter you leave for beautiful Lake Toba and the Karo Highlands. From the Highlands you descent to Bohorok in the Gunung Leuser National Park where you can see the orang utans in their natural environment. You will get information from your guide about the fauna and flora in the tropical rainforest. We can fetch you from the airport. Please give us your flight number. Overnight stay in Hotel Deli River situated just outside Medan in the middle of a tropical garden. Here you can rest after the long journey or make a walk in the neighbourhood. The route takes you from Prapat, along the edge of the lake, to the Karo highlands. En route you pass the tribal kings’ house of the Simalungun Batak in Pematung Purba, the Sipiso Piso falls and pineapple, ginger- and clove plantations. In the afternoon you will arrive at the cool mountain resort of Brastagi. Here you can view tow active volcanoes, the Sinabung and the Sibayak. Overnight stay in Brastagi. Day 5. Brastagi – Bukit Lawang (6-7 hours). In the morning depart to Bohorok/Bukit Lawang, the orang utan rehabilitation centre via many rubber and palmoil plantations. It takes around 6-7 hours driving from Brastagi to Bohorok/Bukit Lawang, part of Gunung Leuser nature reservation in North Sumatra province. After lunch (optional) you start for 3 hours jungle trekking with an experienced local guide in the tropical primary rainforest to see orang utans, Siamang (long arm apes), Thomas Leave Monkeys, long tail macaque and varieties of birds and others wildlife. In the afternoon you return to Bohorok. Overnight stay in Bukit Lawang. Your accommodation in Bukit Lawang is located on the banks of Bohorok river. Day 6. Bohorok – Medan – airport. The last day of your North Sumatra tour, you descend to the coastal lowland area of Medan, along an impressive route through the jungle. After arriving in Medan, you go straight to the airport Kuala Namu for your next destination.This tour can also be followed in the reverse direction. 2 – 3 persons US$ 495 -per person. 4 – 6 persons US$ 410 -per person. 7 – 10 persons US$ 340 -per person.